Foodies mark your calendars, as Dublin’s favourite food festival, Dine in Dublin, returns this month, offering a feast of culinary delights from over 65 of the biggest names in the Dublin foodie scene over the course of seven days, from February 22nd to 28th. On Thursday, 4th of February, Dine in Dublin launched its eighth year of the city’s favourite foodie festival with an elite exhibit of Dublin’s finest culinary offerings. Kicking off Dine in Dublin 2016 DublinTown hosted the crème de la crème of foodies who enjoyed a unique tasting menu curated by six of the city’s top chefs and live demonstrations on the night. MC on the night Andrew Rudd of Medley commented on the influence of Dine in Dublin, “I think it’s great because they are so proactive when it comes to the marketing. A night like this they have really gone to town, we have a great guest list and a tweet board. Last year the launch was held on the same night as the launch of ‘Fifty Shades of Grey’, and we were actually trending more so than the movie which is a testament to how good they are”. The evening began with a cocktail reception serving a ‘French 105’ cocktail by The Liquor Rooms, who between courses also prepared bottled old fashioneds and negronis as palate cleansers and digestif ‘Sherbet Sip’ cocktail. Then, Andrew Rudd took to the stage in the fabulous setting of the Mansion House Round Room to introduce each chef and take guests through a live demonstration of the dishes created especially for the launch. Speaking before his demo owner and head chef of San Lorenzo’s, Temple Garner spoke of the value of Dine in Dublin to restaurants, “it just puts in peoples mind that there is stuff going on. It focuses everybody’s attention on the restaurants that are out there that want to push their restaurants more”. Dave Balfe, head chef at The Church said,”it’s going to help bring the local people into restaurants, the tourism is flying but we’re looking to get the local customers”. Chef Stephen Gibson of Pichet said Dine in Dublin gives restaurants the chance to do something different and to excite their diners, “we are creating a bit of buzz around the city. In the past we have offered a tasting menu which we would never do on a normal night, it gives it the opportunity to do something new. This year we are doing something different again, three courses with a glass of prosecco to start”. Michael Collier, head chef at Zaragoza, started the evening off with a delicious Tapa de Queso de Cabra – a honey glazed spinach and goat’s cheese filo and crispy duck filo with almonds and cranberry sauce. This was followed by Richie Wilson, head chef of Fire Restaurant and Lounge, who wowed guests with chargrilled jumbo shrimp, served with wilted samphire, tomato and coriander salsa, along with twice cooked skinny chilli aioli fries. Temple Garner, treated taste buds to porchetta, slow roast gremolata stuffed pork belly with creamed cavolo nero, apricot agro-dolce and duck fat roasties. Then it was over to Dave Balfe, who served Higgins brisket of beef with herb and hazelnut crust and onion purée, drizzled with slow roasted garlic jus. 101 Talbot’s Neal Magee then shared his creation of Wicklow venison with a lentil, sweet potato and bacon cassoulet. Finally, finishing the evening on a sweet note, Stephen Gibson presented a mouth-watering flourless chocolate cake, served with passion fruit curd, hazelnut ice cream and coconut. Each dish was wine paired by Fallon & Byrne’s head sommelier Scott Findlay. His selection included Quinta da Lixa Vinho Verde 2015, ForeFront Cabernet Sauvignon 2012, Meyer-Fonné Gentil d’Alsace 2014, Framingham Pinot Noir 2011, and lastly a dessert wine; Piétri-Géraud Banyuls Mademoiselle 2013. Guests enjoyed Andrew Rudd’s animated hosting talents for the evening, which included a blind tasting with rhubarb flavoured popcorn and food trivia questions, with spot prizes of vouchers for contributing eateries and books for the winning participants. This year’s Dine in Dublin festival is set to be its most successful to date. From the 22nd to 28 of February the programme of bespoke events include the outdoor Dine Pavilion and a host of special offers from over 65 participating restaurants this year. At the Dine Pavilion, which will run for a total of 5 days, the public will soak up the flavour of the festival whilst watching contributing chefs create customised meals. For more information visit dineindublin.ie. Dublin, on your mark, get set, dine! Photography by Andres Poveda Photography . 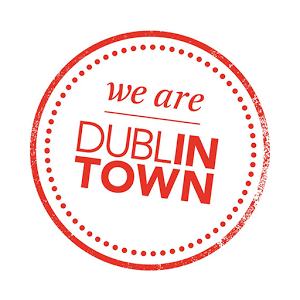 We are DublinTown is Dublin City’s Business Improvement District a not-for-profit organisation charged with creating a welcoming and economically viable city environment. It is a collective of 2,500 businesses in the city centre, from St Stephen’s Green to Parnell Street, and works with its partners to enhance the appeal of the city centre as a place for shopping, recreation and business development. DublinTown is behind popular city festivals such as Dine in Dublin, The Dublin Fashion Festival and Dublin at Christmas. For more information see www.wearedublintown.ie for the organisation site and www.dublintown.ie for the consumer site.